Email marketing is one of the most effective ways of acquiring new customers and reactivating existing customers. However, research suggests that on the average contact list around 60% of emails are inactive as email address checker software is not regularly used. So less than half of your contacts may be receiving your communication and have a chance of opening it. This can seriously damage the effectiveness of email campaigns by reducing your conversion rate. For this reason email address checker software is important to consider when planning your email marketing strategy. It may be a false economy if you don’t invest in real-time solutions to check and verify email addresses when you first capture them. You should also regularly conduct data cleansing of your lists to maintain the quality of existing customer contact details. Email address checker solutions will normally validate the format of emails, remove duplicates, remove role emails (e.g. sales@), compare against a bounce file, compare against a complainers file and remove disposable emails. You may also be interested in the post: 4 ways to improve your email marketing conversion rate. 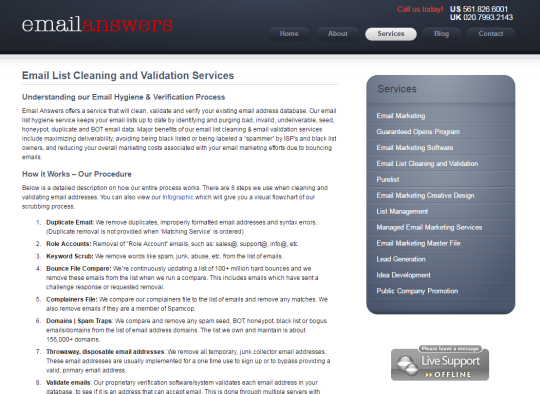 Below you will find 19 leading email address checker solutions to cleanse and verify emails. Our recommended email checker solution is Snov.io because it includes a new Chrome extension Email Verifier tool. If compared by price, Snovio extension is cheaper than competitors, whilst maintaining the same level of service and quality. 1. Snov.io: Offers a multi-step email address verification and validation system. This includes a syntax check, domain validity, check against database of bounced emails and finally a multiple SMTP-check. This helps to protect sender reputation and increases email delivery rates. Snovio Email Verifier allows you to verify email address or validate email addresses in bulk as you browse. The tool removes invalid email addresses and reduces bounce rates, so you improve your email marketing conversion rate. It also allows you to verify a list of email addresses in the extension box and you can copy and paste results or get a CSV list from the app. 3. Data8: A comprehensive suite of email checker software and data management tools including validation, cleansing and data supply solutions. This includes software for email verification, plus phone, address, bank and identity validation. Data8’s software is a comprehensive email checker, with flexible licencing options and easy to integrate APIs for websites, CRM systems and shopping cart platforms. 4. Data Improver by Neopost: A purely browser-based email address checker to validate and enhance you data. Aimed at SMEs the service just requires you to upload your contact data file and select the service you require. Neopost estimate that in the UK customer data changes by between 7% to 21% every year and so needs to be regularly cleaned and updated. 5. emailanswers: Email address checker software that applies a rigorous eight step process which involves; removing duplicates, role emails (e.g. sales@), keywords ( e.g. spam, junk) , compare emails against the bounce file, complainers file, domain/spam traps, disposable email addresses and validate using proprietary email verification software. 6. EmailverifierApp: A full email address checker and validation service. Offers advanced list cleaning using a 12 stage email verification process to protect your sending reputation by scanning for typos, spam-traps, complainers, disposable emails and more. 7. Experian: Provides a comprehensive range of email address checker and data validation and cleansing solutions. They allow you to capture accurate data via real-time email addresses verification software and also validate email addresses already held in your business databases. 8. HuBuCo: Offers email address checker services and real-time validation as subscribers sign up on your website. They have a single API for integrating with your application and a bulk API for organisations wanting to resell email validation services. UK-based 24/7 customer support team available to answer your queries. 9. Informatica: Instant and accurate email address checker software and list cleaning Email Verification Plus Hygiene reduces the chances of an email not being delivered and improves email marketing performance. The service will check if the email address is valid or will it bounce and is there any risk to sender reputation in sending an email to the address. 10. 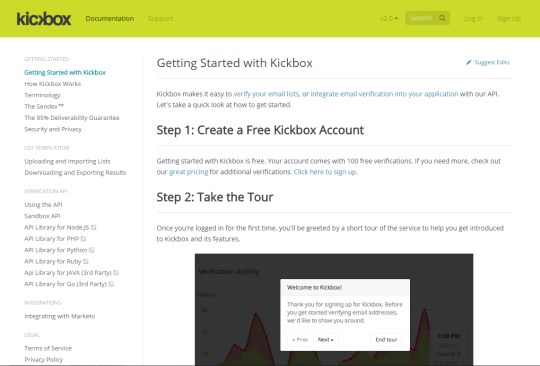 Kickbox: Offers email address checker software, list cleaning and integration of email verification into your application process. Kickbox verifies email addresses using a Simple Mail Transfer Protocol to check it is a known email address. By checking with the would-be recipient’s email server via SMTP, they establish whether a user for a given email address actually exists. 11. MailboxValidator: A browser-based solution that requires you to upload your list as either a text file or CSV format to verify and clean up your email list. The solution connects to the mail server to check whether the mailbox exits to reduce bounce rate and costs. 12. Matchcode360: Provides a comprehensive and global range of data capture and validation solutions including email, postal addresses, landlines and mobile numbers. It is easy to install and compatible with Salesforce, SAP applications and Microsoft CRM. 13. MelissaData: Provides a full range of web-based data capture, cleansing and management solutions with a global reach. They claim to remove 95% of bad emails in your list and help you avoid blacklists and spam folders. They also correct general formatting and syntax errors to turn undeliverable addresses into deliverable ones. Melissa Data offers a Free trial for their Global Email Cloud Service which provides real-time email mailbox verification, corrects common typographical errors, and standardizes email addresses as they are entered – which eliminates the need for the ‘Confirm email’ field in sign-up forms and checkout. 14. PCAPredict: Delivers a full range of data capture and cleansing services, including email validation, address, mobile and payment validation. The service verifies the domain and that the mailbox really exists and can receive incoming mail. It also checks the validity of business and personal email addresses, even for free web-mail services such as Hotmail and Gmail. Batch cleanse offers to process your existing address list to remove bogus and mistyped email addresses. 15. QuickEmailVerification: This is a comprehensive email address checker and data validation solution that checks email addresses against a number of different validation criteria including RFC syntax and deep level SMTP testing of user inbox existence. It offers bulk email verification by uploading text csv files and real-time email address verification by integrating the REST API into your application or website. A free service is available for up to 100 email addresses per day. Pricing plans start at $4 and work on a pay as you go basis, with no timeline or expiry. 16. StraegicDB: This is a full service data cleansing company with services including: address verification, email verification, data de-duplication, field standardization and normalization and other custom data cleansing needs. We also offer marketing analytical services including segmentation, lead scoring, building marketing dashboards and other ad-hoc analysis. email domain, mailbox check predicts if emails will bounce, diagnostic codes categorize reasons why emails are bad, and email delivery metrics monitor how old an email is and when it was last opened. 18. ValidateEmailAddress.org: A free email address checker that verifies individual email addresses. Alternatively you can subscribe to their bulk-email address checker at Bulk mail verifier. This is a cloud-based email address checker that removes dead emails, invalid syntax and fake email addresses from your subscriber or email lists. 19. Xverify: Real-time email address checker and data verification platform. This includes checking at the server to ensure the username is registered at the domain and using their suppression list. Their suppression list has millions of email addresses that are classified as temporary, high risk or complainers. The service can verify all the major consumer email providers including Gmail, Yahoo, AOL and Hotmail. Also offers address verification for the USA and Canada. 100 free verifications available for new customers. Volume discounts apply depending upon total verifications per month. Email marketing is an important driver of sales and engagement with visitors and prospects. However, unless you spend time and money on real-time email address verification software and regularly clean your data the effectiveness of your campaigns will suffer. Don’t let this happen as despite the availability of large contact lists quality is still more important than quantity. Email address checkers are not a luxury, they are essential for any organisation that is serious about email marketing. Thank you for reading my post. If you found it useful please share using the social media icons on my site. We are truly the best on the market in both prices and deliverability. There is a free trial if you want to try. I would like to recommend another excellent email validation service, which is EmailChecker.io (https://www.emailchecker.io). If you have a large list and validation speed is a concern, I highly recommend this company. Very accurate and fast!